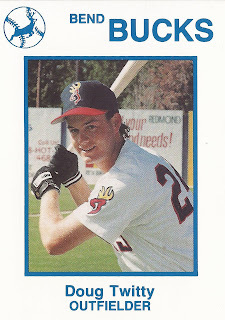 Young pitching phenom Todd Van Poppel prepared for his professional debut against the Bend Bucks in July 1990 and the Bucks, including outfielder Doug Twitty, prepared to face him, according to The Bend Bulletin. "I think we'd all like a chance to hit against a guy with a $1.2 million arm," Twitty told The Bulletin. "I wanna rope him." The Bucks that night only managed a single hit in 3-plus innings against Van Poppel. Twitty, however, didn't make the lineup. He also didn't play beyond that season, his second as a pro. He never made AA. Twitty's career began in 1989, taken by the Athletics in the 25th round of the draft out of the University of Nebraska. Twitty also attended Mt. San Antonio College. At Nebraska, Twitty knocked in 48 runs in 1989 and hit five triples. He also made second-team all-conference. Twitty started with the Athletics in the rookie Arizona League and at single-A Modesto. He hit .374 in 33 games in Arizona and .233 in 12 games at Modesto. He then played 1990 at short-season Bend. He went 2 for 4 in the season opener, knocking in one and scoring once. He went 2 for 5 in an August contest, with a run scored. He got into 57 games overall and hit .240 to end his career.